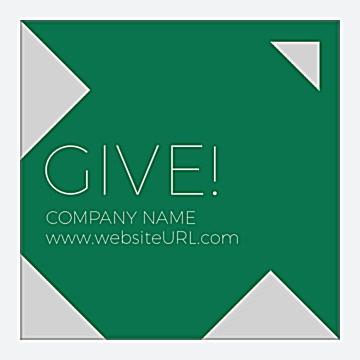 Command customer attention with our bold Arrow sticker design template, ideal to emphasize your message whether you’re saying thanks for your business, please give, or announcing a sales event or item. Arrow is available in four different color schemes and two edge finishes. Arrow features a minimalist design with a bold, dramatic arrow filling most of the space and ample room on the arrow for your company name, website URL and custom message. Print custom stickers using our Arrow design template today! Our online design tool allows you to design custom stickers fast and easy. To start, just click to select your favorite template from our professionally-designed template library. Then personalize by choosing your color scheme and adding the text information you want. Once you’ve created your sticker design, you can click and choose your sticker paper stock options and printing turnaround, then place your order. You can even print a free PDF of your design so you can get feedback from colleagues before you print! Affordable pricing and great value make PsPrint’s custom stickers a great choice for marketing your business. We use only premium, richly-colored inks and high-quality paper stock to make your stickers stand out above your competitors. Our 100% customer satisfaction guarantee ensures that you’ll be delighted with your final product! Do you want to display promotional stickers outside? Our vinyl decals are perfect for indoor or outdoor use. For affordable convenience, try our sheet stickers. And don’t forget, PsPrint offers a full line of other print marketing products, including business cards, brochures, labels, product hang tags, and more! Make PsPrint your one-stop online print shop!